Aiden O'Brien and Alan Browne each scored a brace. THE MAGIC OF the Cup was seized by two Irish internationals on Saturday afternoon, as Aiden O’Brien and Alan Browne each nabbed a brace in FA Cup wins for Millwall and Preston. O’Brien was on target twice and chipped in with an assist too as Millwall came from behind to dump Barnsley out and ensure their progression into the last 32. The sides met at The Den with four places and four points separating them in the Championship pecking order, however despite an early setback Millwall prevailed with ease in the second half. Brad Potts struck early to give Barnsley an 11th minute lead before London-born O’Brien nabbed an equaliser ten minutes before the break, with Ben Thompson giving the Dockers a 2-1 lead after the interval. O’Brien made it a two goal cushion with his second of the afternoon — his fourth goal of the season in all competitions — before Fred Onyedinma made sure of the win with another half an hour from time, making it 4-1. 24-year-old striker O’Brien helped Millwall towards promotion into the Championship last season, scoring 13 goals in League One. He was called into Martin O’Neill’s squad for Ireland’s World Cup qualifiers against Moldova and Wales back in October, but has yet to make his senior debut having previously represented his country at U17, U19 and U21 level. His weekend feat was matched by Preston midfielder Browne, who scored either side of half-time as the Lilywhites eased past Wycombe Wanderers 5-1. The 22-year-old Cork native made it 2-0 seven minutes before the break, with international team-mate Daryl Horgan adding a third to make it 3-1 in the second half. Browne converted a penalty for his second goal of the day to ensure the win — with Josh Harrop adding a fifth for Preston late on. Browne is one of six Irish players at Deep Dale having joined from Cork City in 2014, making over 100 appearances since, with Saturday’s double his second and third goals of the campaign. The injured Sean Maguire remained absent for Alex Neil’s side, however ex-Dundalk defender Andy Boyle made a late appearance off the bench before picking up a yellow card. Email “Irish duo score a brace each as Preston and Millwall progress in FA Cup”. 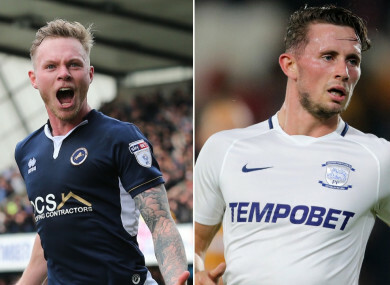 Feedback on “Irish duo score a brace each as Preston and Millwall progress in FA Cup”.